A cold April night in the northeast is not conducive to optimal hitting conditions. That mattered little for Vladimir Guerrero Jr., who already seems to have adjusted to Double-A pitching. It only took him until the fifth game of the season for him to erupt at the plate, and he did so with a career night. MLB.com's No. 3 overall prospect homered for the second straight night, driving in a career-high six runs in New Hampshire's 11-1 win over Trenton on Monday. "It's 30 degrees and you hit the batter's eye off of a pretty darn good pitcher," Fisher Cats manager John Schneider said. "It's impressive." With the Fisher Cats leading in the eighth, 8-1, the top Blue Jays prospect drove a 1-1 pitch up and away in the zone from Jose Mesa Jr. over the 407-foot mark in center field. The 19-year-old hit his first Double-A home run one day earlier against Hartford. "When he hits it, it's usually loud and hard, no exception there," Schneider said. "It's fun to watch him compete and come to work every day." Guerrero Jr. also drilled a two-run double to left in the ninth. Earlier in the game, he drove three runs in with a pair of sacrifice flies and a single through the left side in the fifth. The 2015 international signee finished 3-for-3 after coming into the game 3-for-15 with three walks. Schneider said the advantage lied with New Hampshire on Monday, since Trenton had yet to see Guerrero Jr.
"Once we got a game in against Hartford, they pitched him really tough," the skipper said. "They were really careful with him. I think [there was] a little adrenaline with him to start the season. We saw him expand the zone maybe a handful more times than usual. "He doesn't really waver day-by-day what he's doing. I think he was just a little excited to start the season." After managing Guerrero Jr. for part of the season with Class A Advanced Dunedin in 2017, Schneider has had a first-row seat to the 2017 Futures Game selection's destruction of Minor League pitching. "You kind of say, where do you go from here?" the manager asked rhetorically. "The biggest thing for him is understanding at-bat by at-bat, pitch by pitch, how teams are going to try to attack him and then adjusting along with him. "He's a special dude. He's so convicted to what he's doing at the plate -- really advanced approach at the plate, plenty of physical tools and power. But I think what sets him apart is having a plan, sticking to it, understanding how pitchers are pitching him and what adjustments he needs to make pitch-by-pitch to accomplish what he's doing." Bo Bichette helped set the table early in the game. Toronto's No. 2 prospect collected three hits and scored three runs for his third consecutive multi-hit game. The 2016 second-round pick reached base in four of his six plate appearances on his way to helping the Fisher Cats achieve the best start in franchise history at 5-0. 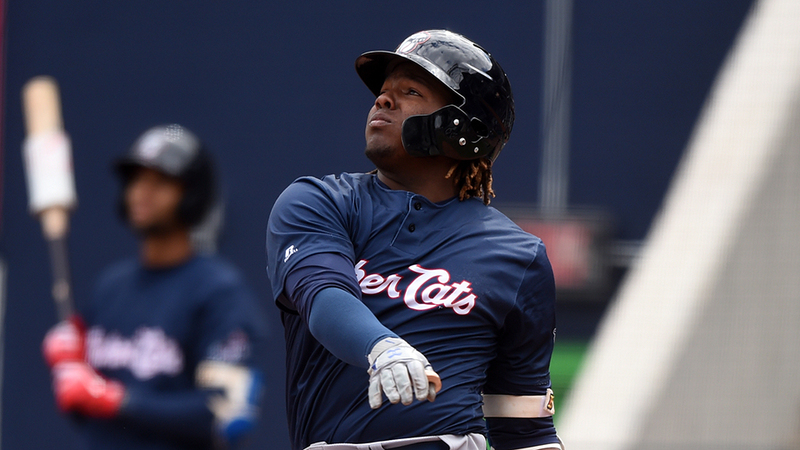 The advanced arms out of the bullpen in Double-A will present a bigger challenge for Guerrero Jr. and Bichette, Schneider said, compared to feasting off overmatched relievers in the lower levels of the Minors. "Here, guys are coming in specifically to get them out," he said. It's all part of the development for two of the game's most promising prospects. "When you write those guys in [the lineup] every day, if you can put them back-to-back, it makes the other staff work extremely hard," Schneider said. "They don't give away many at-bats and they don't give away many pitches. It's a luxury to have and we're having fun watching."